Dr. Katherine Jeffery is a culture-shaping leader, coach, and visionary with over 20 years of experience developing and studying leaders in a variety of holistic environments. Her doctoral research focused on the Millennial generation, their view of leadership, and the ways it is impacting the workplace today. She believes this generation has unlimited value when bridges are built in collaborative, empowered, and strength-based cultures with other generations where teams can perform at their highest level. She holds a BA in Biology and a BS in Psychology from Indiana University, a Master’s degree in Counseling from Clemson University and a PhD in Education. 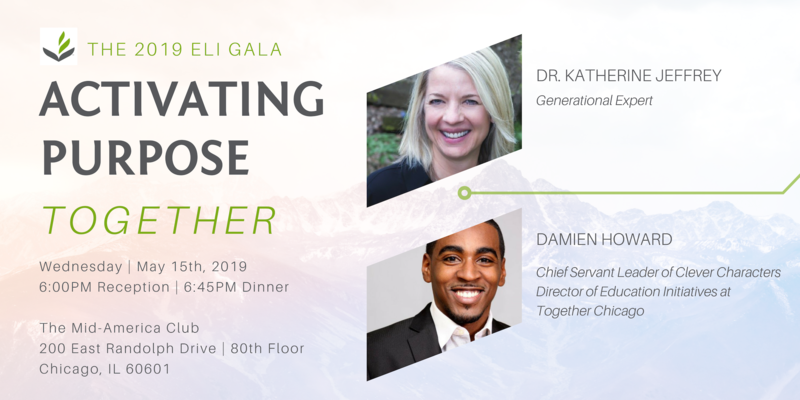 Katherine is passionate about helping companies engage their Millennial workforce and increase their Corporate Social Responsibility while doing her part alongside her husband to help put a dent in ending poverty and slavery through their social enterprise. Damien Howard is an educator with 12 years of experience, primarily with Chicago Public Schools. He cares deeply about Urban Education Reform. Damien teaches character development and life skills to help students thrive in all aspects of their lives. His current work targets schools on the South and West sides of Chicago. Damien graduated from the University of Illinois with a degree in Special Education. Damien received his M.Div. from Trinity Evangelical Divinity School. He is married to Sharial and Gabrielle is their daughter. Views of Chicago's downtown, dinner, drinks, and connections with many Christian marketplace influencers. There will also be an opportunity to tangibly invest in Kingdom impact and take a step towards greater activation of your own God-given purpose. As we look to the fuure, our primary goal is simple – led by God, we seek to serve more emerging leaders and to serve them better in pursuit of life to the fullest and for His glory. Thank you for partnering with us to help emerging leaders activate their purposes for Kingdom impact. Parking is available in the Aon Center garage for $15 or for ~$10 via the SpotHero mobile app. For more information, please contact Katherine Solverson at katherine@emergingleadersinitiative.org. Emerging Leaders Initiative has partnered with Give Lively to securely process your online donation. This transaction will appear on your credit card statement as "Emerging Leaders Initiative". This transaction is subject to Give Lively's Terms and Privacy.